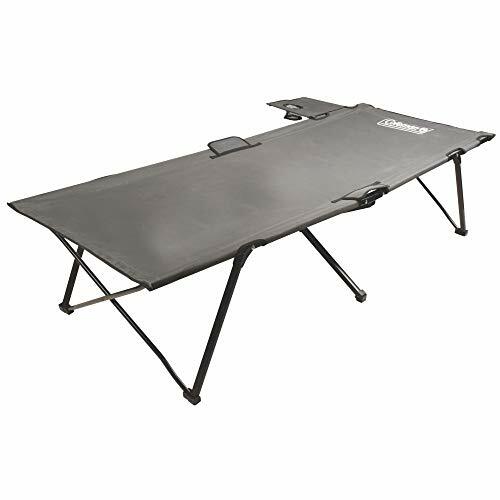 A camping cot is a form of stretcher or bed that the military has been using for several years. While the style and comfort level has improved in several hundred years of existence, the concept remains the same. It’s a portable bed that allows you to get a night’s rest – no matter how broken that slumber might be. The market is now full of cots that serve all purposes. You can take them on camping trips, hiking, or as emergency bedding during natural disasters. They also prove useful for children’s sleepovers or when guests stay during the festive season. How comfortable the person sleeping on it is relies on the features of each cot and how they stack up to others on the market. Does it have enough padding? Is it straightforward to assemble? Does it balance your weight out well? Does it pack away small? Does it fit into your price bracket? Before you purchase a camping cot – spending a lot of money – you may like to do your research. Read on to find out more about the vast selection on offer as well as the considerations for making the right purchasing decision. A few minutes extra in reading could save you a fortune. Many people choose not to go camping because they find the experience uncomfortable, but that might no longer be a problem thanks to this camping cot from Alpcour. Designed to mimic the comforts of home, it’s the ideal addition to any tent our outdoor adventure environment. 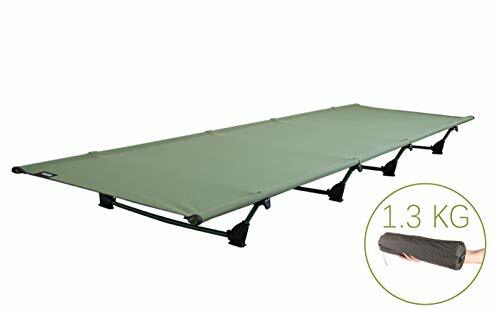 You can buy this camping cot in grey or army green and enjoy how lightweight and portable it is. Once you fold it down, it packs into a nylon carry bag that will fit in the trunk of your car. However, over time, this bag can rip. Fortunately, the cot itself is impressive. Once you fold it out flat, it’s capable of holding up to 300 pounds, and even comes with a pillow to save you having to bring your own. However, for comfort reasons, you may like to consider your own anyway. On the side of the cot you then get to use the storage pockets which come in convenient. The strength of this camping cot comes from the 600-denier polyester fabric – of which there are two layers – and the robust steel framework. When the time comes to upgrade your bedding for your next outdoor adventure, you may like to check out this camping cot from Alpcour. If a bit of weight and noise don’t bother you, then there’s every reason to consider buying this camping cot from REDCAMP. As a convenient and portable bed, it folds up and stores neatly in a storage bag. It might be a bit heavy to carry, but it will fit inside most vehicle trunks. You can use this folding camping cot in a range of situations – almost any time you need a spare bed. You can buy it in four colors and styles, enjoy peace of mind from its one-year warranty, and know it will last the distance thanks to the 600-denier polyester and steel framework. There’s a lot to love about this cot. Furthermore, convenience is on your side when you buy it. Setup time takes a mere ten seconds, far less than having to set up fold-down couches or trundler beds that you’ll use once in a blue moon. It’s also suitable for people up to six feet two inches in height and 250 pounds. The noise when you sleep on it can be distracting, but all in all, this solid and well made camping cot is one that will impress night after night. When you choose to buy this camping cot from Coleman, you are going to enjoy the comfort that’s on offer, but you’re also going to need a lot of storage space! Unlike other cots for sale, this one tends to carry a lot more bulk, meaning you will need to set aside a bit of room for it. However, aside from that and the occasional creak from the base, it’s going to tick a lot of boxes. You can buy it in black or grey to suit your decor, then enjoy the robust and solid steel frame for peace of mind. The entire cot also supports someone weighing up to 300 pounds and up to six-foot-six in height. When it comes to comfort, it covers all bases here too. 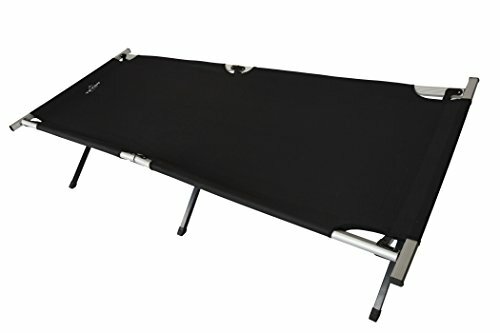 Unlike other cots with only polyester fabric, this one has a sound base as well as coil suspension and a foam mattress pad. You may or may not like to put a blanket on top and underneath this as the pad can slip around on the base. When you are finished using it as a spare bed or when you’re camping, you can then fold it down and store it away for later use. When it comes to convenience and comfort, don’t look past Coleman ComfortSmart. The camping cot selection is vast, but if you’re looking for a no-frills cot that doesn’t cost the earth, then set your sights on this model from Coleman. 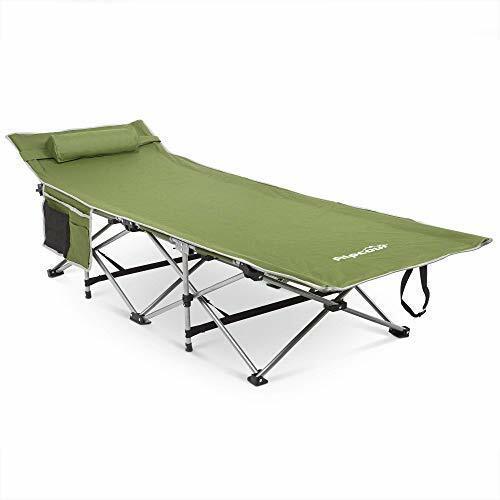 As a Trailhead II military-style cot, it does everything a more expensive brand does, but without many of the complexities associated with pricier models. When it comes time to get this cot out of its supplied bag and set it up, the ease of the process will astound you. It stretches out in record time to its full height, catering to people weighing up to 300 pounds and six-foot-two in height. Its steel frame coupled with the polyester fabric then helps to ensure you remain comfortable and secure for a full night of rest. What will also appeal are the storage pockets. Instead of leaving your phone, keys, and wallet on the floor for someone to trample, you can put them in the pockets and enjoy the security on offer. 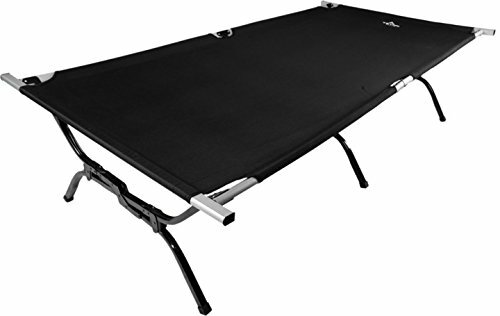 This affordable camping cot is an ideal solution for camping, or as a spare guest bed in your home. Its price tag coupled with its comfort will have you adding it to your shopping cart in no time. Many people who use a camping cot find it inconvenient to have to sleep on their own, instead of sleeping next to their loved ones. This cot from Coleman solves that problem. Not only is it a double folding cot – so you can sleep beside your partner, but it has an air mattress too. The air mattress adds additional comfort to this setup. 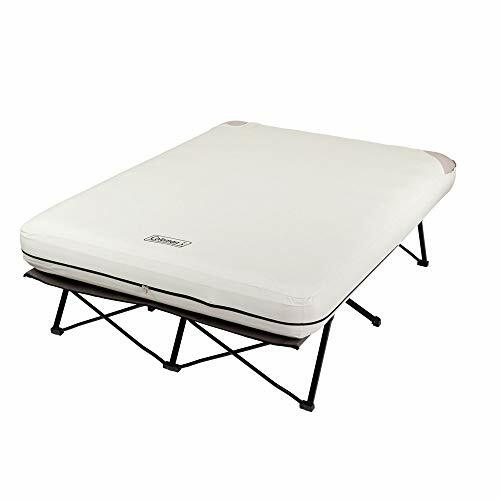 You can expand out the steel cot supports, blow up the queen mattress using the supplied battery-powered pump, then insert it into the zippered lining. You can then make it up like any other bed – it won’t feel like you’re camping at all! What you may not like about this camping cot, however, is its size. Once folded up, it can take up a fair amount of space in your vehicle and home, and it’s also quite heavy to carry. The included bag is also a snug fit if you’re trying to get it back in. These points aside, if a traditional camping cot doesn’t fit your idea of luxury, then this one might. If you’re in need of quick and easy bedding for family and friends staying, or you’re going on a camping adventure with limited space for gear, then this camping cot could be for you. It’s by no means the most luxurious option on the market, but its price point makes it desirable for many people. In essence, it’s a no-frills approach to camping with all the convenience you need. All framework components are powder-coated and stainless steel, and these have a polyester frame cover that goes over top. It’s comfortable, lightweight, and is also compact to store away at the end of your camping trip. If there’s anything to complain about, it’s the assembly process. This camping cot comes with a lot of parts – not all of which are user-friendly to install. Some poles also fall apart as you are trying to assemble the frame. It may take one or two people at least ten minutes to put together. Assembly aside, there is still much to love about this product. It comes with a carry bag, weighs next to nothing, and is well made and solid to last the distance. It won’t win any awards for design, but it’s a valid option for your next camping trip nonetheless. If you need a camping cot for a hiking adventure where you need to carry your life on your back, then this one will suit your needs well. At a little under four and a half pounds, it weighs far less than your average camping cot. You’ll barely know you’re carrying a bed on your back. Even though this cot weighs next to nothing, its strength is astounding. It will handle up to 265 pounds of weight and someone of a height up to six-foot-four. It also has 420-denier polyester fabric that sits upon aluminum alloy rods and four stents. Even if you need a pillow, this cot bed caters to your needs here too. Put the included storage bag inside the pillow bag area and you have a makeshift one. Alternatively, you can put clothing in there. Sometimes, the feet can kick out from underneath you, and the fabric might tear with regular use, but for convenience while you’re hiking or backpacking, there are few better than this one. 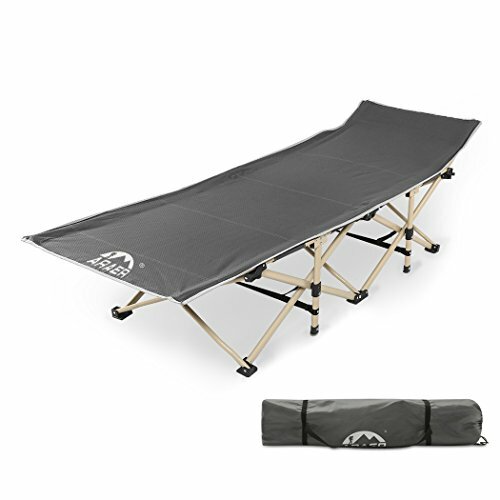 Aside from this camping cot tipping if you lie or sit on it funny, it’s packed full of convenient features that are bound to have you adding it to your shopping cart immediately. When it comes to comfort, it’s one of the best. Not only does this cot fold up to a compact size, but it folds out to several convenient angles to suit your needs. The adjustable ratchet backrest sees you sitting up, lying down, or lying flat – whichever you require. It also has a foam padded mattress which many others don’t have, and polyester fabric that’s durable to stand the test of time. Even the powder-coated steel frame will impress, with a 300-pound weight capacity for peace of mind. This assembly-free and competitively priced camp cot is one that will appeal to the masses for a range of reasons. Buy it for your next camping trip or as a spare bed for family and friends. With the exclusion of the hard pillow that accompanies this camping cot, there is a lot to love about this military-style cot from Purenity. It’s affordable, comfortable, effortless to transport, and will fit into any tent with relative ease. It’s even the perfect guest bed should you have people to stay over at the last minute. You can buy this camping cot in blue or grey then enjoy all the features it has to offer. It comes with a comfortable and padded foam mattress, a steel frame, and a generous six-foot height and 260-pound weight capacity. That’s more than enough for most people. What’s more, it’s lightweight at 11 pounds and requires no assembly. If the time has come to upgrade or add a new camping cot to your outdoor gear repertoire, this is an excellent option for you. A camping cot is a convenient item to own – even if your camping trips are few and far between. You can use them for emergency bedding, for guests, or for friends who want to crash at your place at a moment’s notice. However, when it comes time to buy one, you want to be as sure as you can be that whoever sleeps on it is going to get the best night’s sleep possible. The following criteria can give you a fighting chance. The first thing to consider is how much you want to spend. The more you spend, the better quality the camping cot tends to be. However, you have to weigh up whether all those “frills” matter more to you than paying less money. Not every camping cot will be suitable for everyone, as the weight and height capacity can differ. In most cases, you can expect them to be suitable for 250 pounds with a height of around six feet. However, some allow for more or less – depending on the make and model. Before you purchase your new cot, read through the description and make sure it’s right for you. When you go camping, there is an immense amount of effort involved in setting up everything. The tent alone can take several hours if you’ve never done it before. Therefore, the last thing you want to do is buy a cot that poses that same hassle. Take note of the assembly process for the cots on your “maybe” list and determine whether they are worth it. Some have several parts which require you to build the frame, while others pull out in one piece like a camping chair. 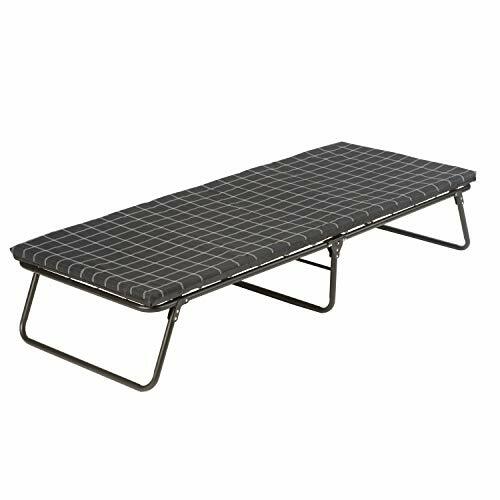 Even though most camping cots have polyester bases and steel framework, some are better and more solid than others. You aren’t going to know by looking at the pictures though. The best way to get a representation of material quality is by looking at the customer comments. Find out if the fabric tears or is noisy to sleep on, and whether the steel framework is as solid as the manufacturer makes it out to be. Having this information before you decide on the cot to buy can end up saving you a fortune. Finally, there’s nothing worse than trying to sleep in an unfamiliar environment when your bed is as hard as nails. Having a comfortable cot can mean the world. To find out the comfort level of any cot, read the customer reviews. People who already own the product offer the most honest portrayal of what it’s like.